The under appreciated drone does not have a stinger. While holding him, I also noticed that his proboscis was noticeably shorter than that of the worker bees, perhaps because he does not forage and therefore does not need a longer one. But first, a few words regarding the demise of the Flaming Maples. 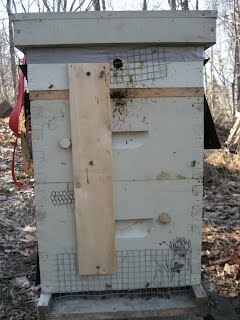 After a final hive tipping in mid November, the bear seemed to disappear. I assumed he had bedded down for the winter, but in December, a neighbor informed me that a black bear had been killed near Melzingah Resevoir, about four miles south of us. He had in fact seen said bear after it was shot (killed with one arrow), and told me that it weighed in at 175 pounds dressed (which apparently means undressed). Given that we have seen neither hide nor hair of the beast since then, I am assuming that that was him. The Flaming Maples tried their best to regroup, but with no queen, a sharp decrease in numbers and high stress levels, I did not have much faith in their making it through the winter. 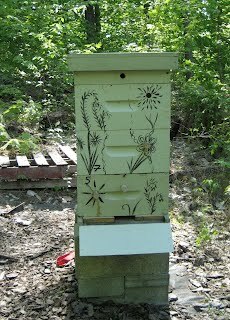 Sure enough, a quick knock on the hive in February was answered with resonating silence and a peek in confirmed my fears of a dead out. 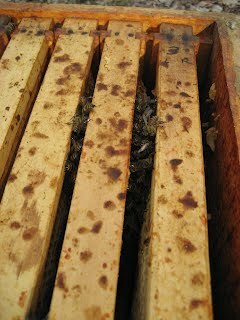 From the top of the hive box, I could see that the cluster was very small, the size of a softball versus that of a soccer ball that a strong hive would form. Pulling the frames out, I could tell that even though the girls had honey right below them, they starved to death, unable to move around in the dead of winter. I was amazed that even without a queen, their instinct for survival told them what to do, and it broke my heart to imagine them in there, struggling to keep their small cluster warm and fed. The House Hive got through the winter swimmingly however. 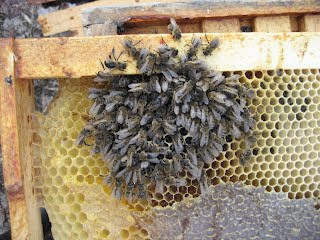 Taking a peek in March, I found the hive loaded with nectar and pollen. And frames covered with bees!! Note the puffy capped drone cells. Since March, I have watched as the mite levels have soared, and two rounds of Oxalic acid did not made a dent. This past week, I put in Mite Away Quick strips (Formic acid) and hopefully that will do the trick. A beauty on a beauty.